Neighbors | Jessica Harker.Ross, Opal and Amber Kelty sat and listened to the YACCB at Boardman Park on July 26 for the Music in the Park concert series. Neighbors | Jessica Harker.The Youngstown Area Community Concert Band plays Maag Theatre in the Boardman Park on July 26 for the Music in the Park concert series. Neighbors | Jessica Harker.Director JoePellergrini announed the compositions being plays on July 26 at the Maag Theatre in Boardman Park. 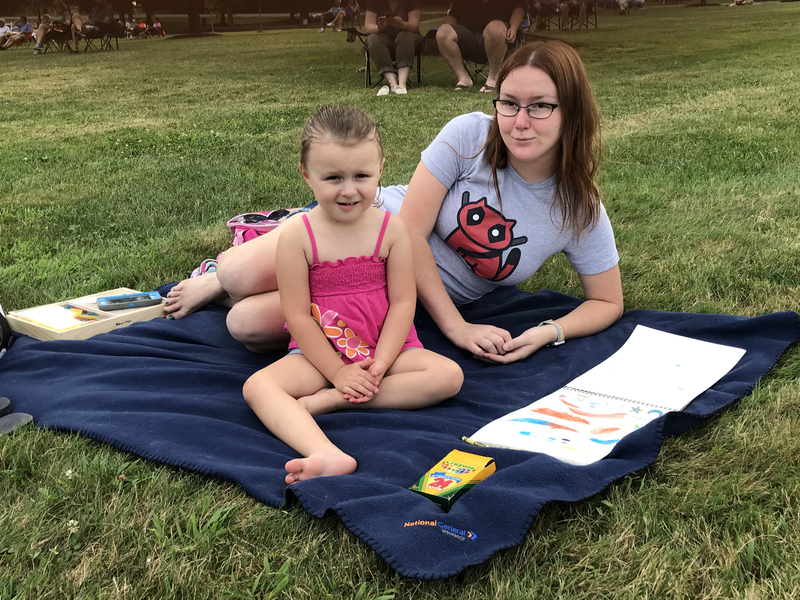 Neighbors | Jessica Harker.Jessica and Nora Wilson sat on a blanket and colored while listening to the YACCB on July 26 in Boardman Park. Neighbors | Jessica Harker.A large crowd gatherd at Boardman Park on July 26 and listened to the YACCB during the Music in the Park concert series. The Youngstown Area Community Concert Band played at the Boardman Park on July 26 at the Maag Outdoor Theatre. The concert was part of the ongoing music in the park series sponsored by The DeBartolo Corporation, Pepsi and Great Garage Doors. The YACCB is a nonprofit organization that is composed of volunteer musicians according to Joe Pellergrini, the director. “We are made up of great musicians who play for the love of playing,” he said. The theme of the concert was water, and the band played both classic compositions as well as more recognizable tunes, including “My Heart Will Go On,” by Celine Dion. During the concert a student from Austintown Fitch, Matthew Smutny, played a solo for one of the compositions. Smutny is going into his junior year at Fitch and plays the saxophone in the high school’s band. The Boardman Kiwanis Club sold concessions during the event, the proceeds of which benefitted the club. The Kiwanis Club, along with a number of other local organizations, take turns on a rotating basis selling concessions throughout the concert series. Pellergrini said that the YACCB has been a local nonprofit organization for 35 years, and that they rely on concerts like this, as well as donations from supporters to keep them going. “Nothing ties us together except a love of band music,” he said. To learn more about the YACCB, how to support the group or where it will play next you can visit www.yaccb.org.